Each one of us are different, and at the same time indispensable. What makes us different enriches us and makes us special. Each individual identity is infinitely valuable. The important thing is not to be the same, that we are not, nor is it desirable that we be. The important thing is that we are ONE. We have our own identity and at the same time we are all inevitably united in the collective of Humanity. Races, religions, cultures … enrich us but we are still ONE. 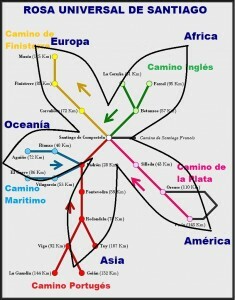 This is what representing 5 paths of 5 continents. Is the universality. Even if there were human beings on other planets, we would also be ONE and be part of this same group of Humanity. Each time we walk in representation of a continent we put ourselves in the role of representing the men and women of that continent, with their different skin colors, their different religions and cultures, even the different landscapes with their different animal and plant species. We also do it in the constant recognition of the other pilgrims who walk the other routes in representation of the other continents. Thus each one keeps his own individual Identity and at the same time elevates the consciousness to the Universality of the five ways of the five continents, which form on Santiago de Compostela a Universal Rose with five petals, in which Santiago is the heart of this Universal Rose. Universal Rose of Santiago represents the collective of humanity. When a human being suffers, whoever he is and wherever he is, the entire group of Humanity suffers at a certain level. Recognizing universality is essential to solve all the injustices of the world.